How Long Do You Spend in Prayer? I was recently was talking to a friend about my personal times with God. He is someone I trust and respect, but I noticed feeling a bit conscientious telling him what I did. My times with God don’t look like the common Christian’s experience. While I used to have more structured Bible studies and/or prayer lists, nowadays it just hasn’t looked like that. Even though I feel confident about my relationship with God, I sometimes doubt other people’s views. I know I can’t control other people’s opinions, but when it comes to people I like, I can be sensitive. This was a friend of mine, and I felt my own uncertainty. Anyways, this line of thought kicked around in my mind enough to put together the start of a blog post on how long should we pray each day. So far, the post is too long, so I am reworking it to consolidate the information. As I do this, I would like to hear from you on how long do you pray each day. I have put together a quick poll at addpoll.com to facilitate your answers. If you have other thoughts, please add them below in the comments. I would love to hear from the Prayer Coach community on this topic. Thanks. 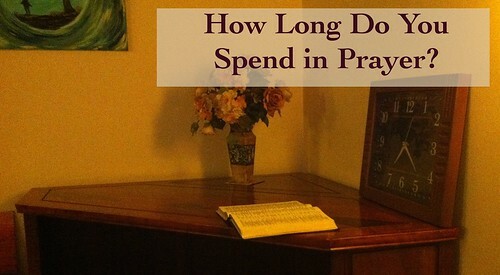 Here is the post on How Long Should You Spend in Prayer Each Day.